Warning: DO NOT SHOW THIS POST TO MY FATHER. The book was SO good, that I bought a copy for him for Christmas. Now, nobody spoil it! And NOBODY tell him to read my blog! Doesn't the title just grab at your heart strings? This book is pretty much one of the best loves stories I have ever read. I mean, it's about food for crying out loud. That's a happy ending for EVERYONE. Jim Gaffigan has hit it out of the park here folks. He's hilarious, clean, detailed, and did I mention hilarious?? I have read or watched most of his stand up, and he never fails to make me bust a gut laughing. This book was no exception. Here Jim takes us around the country and describes food, eating experiences, and his undying love for all things delicious. 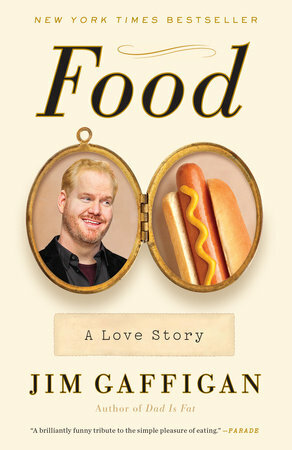 You won't be disappointed - go buy Food: A Love Story today! Disclaimer: This book will make you hungry. No matter how recently you ate. Be advised and don't try to read this book outside the comfort of your own home where you can wander to the kitchen and much while you read. I received this book from Blogging for Books for this review. The opinions are entirely my own.